Gun safes provide an excellent place to store firearms as well as important documents to keep them safe in case of a fire in your home. 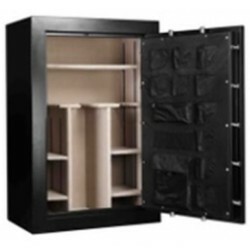 Shop our selection of high quality gun safes perfect for any application. Free Shipping on all orders! The thick steel plate and a fire activated expanding door seal ProMaxx 20 gun safes can secures up to 20 firearms.FREE Fast Shipping! 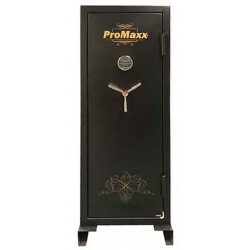 ProMaxx 39 gun safe secures up to 39 firearms. The thick steel plate also protects this safe from burglar attempts at drilling the safe open. FREE Fast Shipping! Make your fire arms safe and secure. 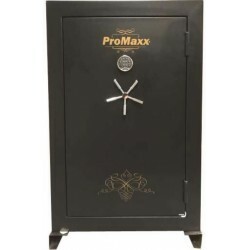 The ProMaxx 51 gun safe secures up to 51 firearms. It is fire resistant up to 1200 degrees fahrenheit constructed of a 1/2" thick steel plate and a fire activated expanding door seal.FREE Fast Shipping!